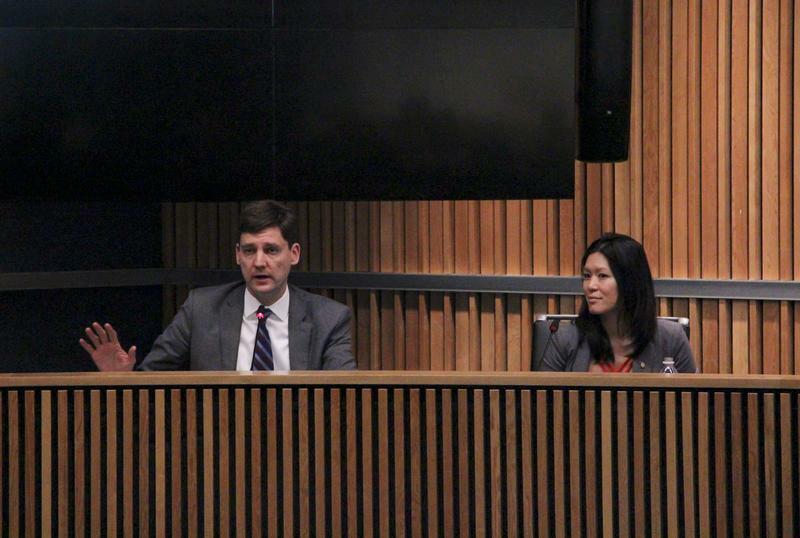 At yesterday’s AMS “Transit Talk,” provincial leaders and students discussed affordable and accessible transportation, focusing on the SkyTrain to UBC and ridesharing. “Today we’re hoping to provide an open discussion for students to ask questions about the future of transportation in our region,” AMS VP External Cristina Ilnitchi said before introducing the guests. Ma provided an update on the 10-year plan that Translink has crafted regarding improving transportation in the Metro Vancouver area. “There are more B-Lines coming in Phase 3 of the mayor’s plan,” Ma said. “We just haven’t secured the multi-layered funding for that. Most relevant to UBC students, the SkyTrain extension to campus has received approval from the Translink Mayors’ Council in February and from the Vancouver City Council in January — the first steps in a long process toward completion. Eby said he is optimistic about its eventual implementation. “There’s so much momentum around it right now,” he said. The small but active group of student attendees then asked about issues such as funding for Translink, mobility pricing and rideshare possibilities in Vancouver. Regarding ridesharing, Ma hopes that it will be introduced in BC by the end of 2019. But she emphasized the need to be cautious moving forward, citing the increase of congestion that has occurred in some major American cities in response to ride-sharing. “We know that in areas where the relationship between ride-sharing and public transit has not been well thought out and managed, we’ve actually seen ridership stall out,” she said, using San Francisco as an example. The Select Standing Committee on Crown Corporations, chaired by Ma, recently released a Transportation Network Services Report that emphasizes the need for for ride-sharing companies to share data with the government and recommends a minimum cost-per-trip that is more than the cost of public transit. “It is coming, [but] there are a few questions remaining,” Ma said.